18 November 2018 (Wall Street International)* – In January 1984, Dr. Seuss, one of the most popular authors of children’s books ever, who sold hundreds of millions of copies of his books, published The Butter Battle Book. It was a totally unexpected book from a children’s author―an overt political satire and protest against the nuclear arms race. Dr. Seuss considered it his best book, but one that ends pessimistically unlike most of his others. The role of Donald Trump in the New Post-Cold War | Photo from Wall Street International. The Butter Battle bookis full of references to the US-Soviet Cold War, from the building of the Berlin Wall to the deployment of more and more kinds of “advanced” weaponry. The main characters are members of the Yooks, who appear to represent the US and NATO countries, while the antagonists, the Zooks, appear to represent the Soviet Union and Warsaw Pact countries. After a minor incident, the arms race between the Zooks and the Yooks escalates as weapons move up in sophistication from sling shots to the “Tough-Tufted Prickly Snick-Berry Switch,” the “Triple-Sling Jigger,” the “Jigger-Rock Snatchem,” and the “Kick-A-Poo Kid.” The latter was loaded with “powerful Poo-A-Doo powder and ants’ eggs and bees’ legs and dried-fried clam chowder”. The Zooks then developed an “Eight-Nozzled Elephant-Toted Boom Blitz”, which was a machine that shoots “high-explosive sour cherry stone pits”; the Yooks counter with the “Utterly Sputter” which is intended “to sprinkle blue goo all over the Zooks”. Eventually, both sides are able to acquire an extremely destructive nut-sized bomb called the “Bitsy Big-Boy Boomeroo.” The name makes it sound like it is a miniaturized tactical nuclear version of Little Boy and Fat Man, the uranium and plutonium bombs dropped on Hiroshima and Nagasaki. The book then finishes with the lines, “The End” (Maybe). In effect, as the two sides continued to build more and more destructive weaponry, Dr. Seuss was parodying the nuclear arms race and the theory of mutual assured destruction (MAD) and its probable inability to prevent a nuclear war―particularly if one side believed it possessed a tactical and technical advantage over the other. The Butter Battle Bookwas controversial, and it was banned from some libraries. A number of American Neo-conservatives argued that it promulgated the so-called liberal “moral equivalence” argument. 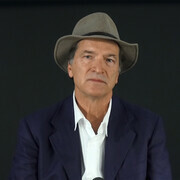 The latter perspective was dismissed by neo-conservatives who argued against liberal concepts of “cultural relativism” and “moral equivalence” that made it look like the US and Soviet Union were similar societies that could be equally criticized and that the struggle against Soviet Union had nothing to do with values such freedom. But the theme of Dr Suess’s story did not imply “cultural relativism” or “moral equivalence”; this was a total misinterpretation. The Butter Battle Bookwanted to show through poetic satire the absurd extent to which conflicting societies with different values and interests could go to defend themselves―to the point of actually perverting their own values and at the risk of destroying both societies, if not the whole world―due in large part to their unwillingness to reach realistic compromises with their adversaries. In Dr. Seuss’ book, the tensions between the two societies and the escalating arms race were largely a result of opposing social customs. Each society buttered different sides of their bread. “Butter Battle” Arms Race | Image from Wall Street International. The Yooks, who saw themselves as right and honest, buttered their bread on the topside; they saw the Zooks as being untrustworthy and having “kinks in their soul” because they buttered their bread on the bottom side. Even though it appears absurd to spark a major conflict over different ways to spread butter over bread, the metaphor has at least four possible meanings. The first meaning is the geo-economic battle for sustenance, for money and for survival, for bread and butter. The second is the economic law of opportunity cost, how a society decides to spend its economic surplus on “guns” (or on warfare) impacts how much it can then spend on “butter” (or on welfare). In this perspective, each side, the Yooks and the Zooks, possess very different values and interests which made it very difficult to cooperate. So the way the two societies in The Butter Battle Bookspread their butter as cause of very dangerous conflict that appears to be started by a very trivial dispute is really not that absurd at all. 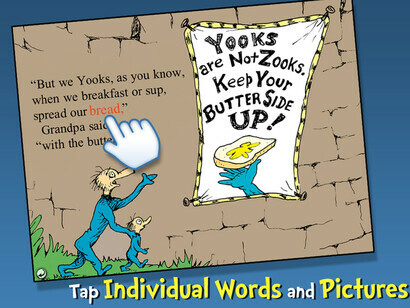 In Dr. Seuss’s book, the colors of the Yooks are blue and the Zooks are orange. This appears to be in contrast with the usual Blue or else Red, White and Blue, for the Americans and Red for the Soviets. Yet, whether by purpose or accident, these colors are the same colors as the two sides in the NATO war games, called Operation Able Archer, played by NATO in September 1983, which, coupled with the deployments of US Cruise and Pershing missiles in Europe, came pretty close to setting off a nuclear war. The 1983 NATO Operation Able Archer military exercises involved some 40,000 US and NATO troops. The war games envisioned a very unlikely scenario in which Blue Forces (NATO) defended their European allies after Orange Forces (Warsaw Pact countries) sent troops into Yugoslavia, before invading Finland, Norway and Greece. The Fall of the Berlin Wall | Photo from Wall Street International. But back in 1983, much like today after the Russian annexation of Crimea in February 2014, and now after the deployments of new intermediate range ballistic missiles, the Novator 9M729 (or SSC-8 in NATO lingo), among other weapons systems, tensions between Washington and Moscow had been escalating after the Soviet Union had deployed of intermediate range SS-20s in 1977 in Europe and Asia. In strategic terms, it was feared that Moscow could launch its intermediate range SS-20 missiles against NATO, Japanese, as well as Chinese, targets, while holding its long range intercontinental ballistic missiles that could strike US territory in reserve―in order to counter the possibility of a US retaliation. In a word, Moscow could theoretically strike the Europeans, if not the Japanese as well as the Chinese, while holding the US nuclear deterrent at bay so that Washington would not counter-attack. As tensions began to mount, Washington and Moscow began to engage in disarmament negotiations, but without an agreed upon result. In November 1983, US Ambassador Paul Nitze and his Soviet counterpart Yuli Kvitsinsky did work out a negotiated compromise, that was dubbed the “Walk in the Woods” proposal, but that proposal was rejected by the Reagan administration. The Reagan administration refusal of the “walk in the woods compromise” eventually led NATO to engage in the “double track” decision by 1983. On the one hand, NATO offered the Warsaw Pact the option to engage in a mutual limitation of intermediate-range ballistic missiles. On the other, NATO threatened to deploy Tomahawk Cruise and Pershing land-based intermediate-range nuclear weapons that could strike Moscow in minutes in western Europe―in case that Moscow refused to withdraw and destroy their SS-20s. Since no deal was reached, the US and NATO opted to deploy US Cruise and Pershing missiles in Europe. Most crucially, the German Bundestag agreed to the deployment of those weapons on West German territory in 1983. This led Moscow to drop out of the INF talks. Anti-nuclear protest | Photo from Wall Street International. The decision to deploy new and advanced nuclear weapons in Europe led to mass protests, with the European Nuclear Disarmament movement obtaining considerable popular support. In addition, there were protests throughout the US. Poets spoke out against the threat of nuclear war. At that time, I was working on my PhD Dissertation at the Johns Hopkins School of Advanced International Studies in Washington DC. As I was seeking to compare the Cold War to previous major power conflicts in history, I went to the Library of Congress to begin my research. I plugged into the search engine of that now ancient computer system, “World War I”, and several thousand books appeared in green letters upon the computer screen; I then plugged in “World War II” and even more books appeared. And I then plugged in “World War III.” Only ten books appeared. The tenth book was Peace or Perish: A Crisis Anthology. Contrary to official propaganda against them, the protesters were not wrong. The US and Soviet Union came very closer to nuclear war. Seeing itself threatened by NATO-Japanese-Saudi “capitalist encirclement” aligned with China, Soviet paranoia at the time was illustrated by the apparently accidental shooting down on September 1, 1983 of a South Korean airliner—which was purportedly confused for a US spy plane. Later in September 1983, an apparent launch of US Minuteman intercontinental ballistic missiles was detected by the Soviet Oko early-warning radar systems, but these were identified as a false alarm. The officer on duty fortunately decided to his disobey his official orders that demanded retaliation with a nuclear counter-attack―at great risk to himself in disobeying Soviet military protocol. Five years after the Reagan administration initiated its deployments of Cruise and Pershing missiles in Europe despite mass protests throughout much of the world, on December 8, 1987, Washington and Moscow signed the Intermediate-Range Nuclear Forces Treaty (INF treaty) after Mikhail Gorbachev came to power. The 1987 INF treaty led to the destruction of all land-based middle range missiles, but not sea-based intermediate-range systems. As the treaty was signed only by Washington and Moscow, it did not prevent China, Iran, India, Pakistan, North Korea, or other states, from building intermediate range missile systems. But the Treaty was nevertheless a major step in forging the peace between Moscow and Washington and helped to bring an end to the Cold War. While the first phase of the US-Soviet conflict during the Cold War did not end in nuclear war as many believed might happen―but which could have and almost did―Dr. Suess’s “maybe” is still relevant in the post-Cold War phase of US-European-Russian-Chinese-Japanese-Indian geopolitical conflict. While the Cold War fortunately ended without a nuclear blast, the post-Cold War period is now entering a new phase that is potentially more dangerous. These new US-Russian-Chinese tensions are partly a result of the fact that the new forms of weaponry that are now being developed and deployed are much more accurate and much more usable. 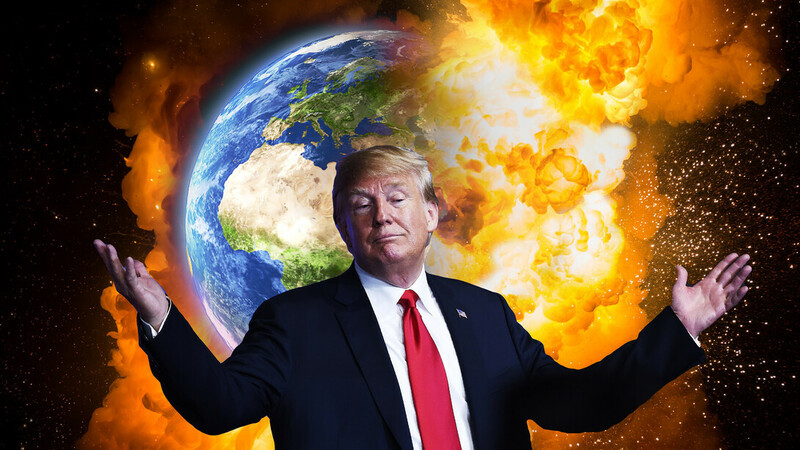 In October 2018, the Trump administration stated that it planned to drop out of the 1987 INF accord in part due to purported Russian violations of the INF treaty. Moscow has begun to deploy the intermediate range Novator 9M729 (or SSC-8 in NATO lingo), and plans to develop other weapons systems and modernize older ones. And much like the George W. Bush administration, who, in 2002, unilaterally dropped out of the ABM treaty signed with Moscow due to the feared development of missile systems by third states other than Moscow, the Trump administration somewhat similarly has planned to drop out of the 1987 INF accord ostensibly due to the fact that the INF treaty does not impact the land-based missile systems of other countries, particularly those of Iran, North Korea, and China. Moscow has claimed that it is not in violation of the INF Treaty and points to US missile defense systems in eastern Europe that could theoretically be used launch a first strike. It should be noted that had Paul Nitze’s original “walk in the woods” diplomatic compromise been accepted by the Reagan administration and the Soviets, these issues dealing with intermediate range missile would probably not have arisen in contemporary circumstances, at least not in the same way. This is true as Moscow would have been able to deploy its missile systems in Asia. In fact, President Putin had already threatened to leave the INF treaty in 2007―unless it was renegotiated to include other states, including China, Pakistan and Iran. Ban the Bomb | Photo from Wall Street International. President Trump’s National Security Advisor, John Bolton, has been arguing for several years that the 1987 INF Treaty interferes with the United States ability “to preserve global security” and that other countries, like China, North Korea, and Iran, face no limits on their intermediate range missiles. The fact of the matter is that the US has initiated a major nuclear modernization program that will cost roughly 1.7 trillion dollars over the next 30 years―money that could be better focused on education, health care, social security, job creation, and other vital social needs including that of resolving social and political conflict. And among other arms programs, the US Congress has mandated that the Pentagon begin to build a new ground-launched intermediate-range cruise missile, even though the US armed forces already possess numerous sea- and air-based systems, and new tactical nuclear weapons. This is all very dangerous and unnecessary. The dilemma is that US withdrawal from the INF Treaty will permit Russia and other states to continue their buildup of intermediate range ballistic missiles. And the decision puts the US at fault for dropping out of the treaty. What are really needed are new multilateral arms reduction negotiations that can lead to a significant conventional and nuclear weapons reductions on all sides, while concurrently enhancing security and confidence. In addition to Russian missiles, the UK, France, China, India, Pakistan, Israel, Iran, North Korea, all possess intermediate range nuclear weapons. There will be no abatement of this crisis unless the US and Europeans can find areas where the major powers, the US, Europeans, Russia, China, Japan and India can cooperate. This evidently will not be an easy task, but it can and should be attempted. Unlike the Gorbachev period, Moscow is more likely to take a much harder line toward US policy, even once Putin steps down. And it looks like both Russia and China―as some 95 percent of Chinese nuclear weapons are intermediate range and aimed primarily at Taiwan, Japan, India, and South Korea―will get even tougher in response to President Trump. US sanctions and the threat to use force alone will not result in peace, but in counter threats and a renewed weapons buildup with more and more advanced systems of weaponry. Mikhail Gorbachev, A New Nuclear Arms Race Has BegunNew York Times (October 25, 2018), Henry Kissinger, George P. Shultz, William Perry, Sam Nunn, A World Free of Nuclear Weapons, Wall Street Journal (January 4, 2007). See Hall Gardner, World War Trump: The Risk of America’s New Nationalism(Prometheus Books, 2018) and Hall Gardner, IR Theory, Historical Analogy, and Major Power War(Palgrave-Macmillan, forthcoming). Hall Gardner‘s article was published in Wall Street International. Go to Original.